People seem to have strong opinions regarding Van Dyke Parks. Critics try to dismiss his work as pompous, art-rock fit for only cult status. Others proclaim him a genius, whose debut album, Song Cycle, is a masterpiece. Where am I? Well, I'm on the fence. While I don't always "get" his work, it is always intriguing. 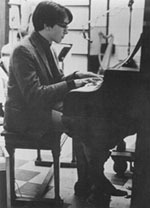 I was first aware of Van Dyke Parks through his work with Brian Wilson on the aborted Beach Boys 1966 Smile album. His sometimes abstract, picturesque lyrics would have really pushed the Beach Boys to the next plateu of rock ‘n roll. But, it was not meant to be and Smile can only be found in bits and pieces. But, I digress, this is only ONE of Van Dyke’s many, many projects. Fast forward to present day. My first Van Dyke Parks record was his 1995 album, Orange Crate Art. It was my love of this record made me seek out other Van Dyke projects. I finally scored a copy of Song Cycle. My opinion? Well, I still haven’t made up my mind. Classic? I really don’t know. But…it is an interesting album and I’ve enjoyed trying to ‘figure’ it out! And nothing else from 1968 sounds quite like it. When I did a little research on Van Dyke, I discovered what a true Renaissance man he really is. He’s been a studio session musician with some of rock and roll’s most prominent players; his solo career has spanned three decades; and he has an impressive list of film scoring and instrumentation/arrangements for other artists. Within the confines of an EAR CANDY interview, I tried to touch on the highlights of Van Dyke’s career. I only touched the tip of the iceberg. E.C. : Although you’ve recorded numerous albums, Song Cycle seemed to get the most attention, overshadowing a lot of your subsequent work. Do you feel you were unfairly pigeonholed as an “art/concept” rocker? Van Dyke Parks: Certainly not! It comes as no surprise that my work is difficult to categorize. But that's not by intent. I simply try to create on my own terms, and rise to my own expectations. E.C. : Your resume of studio work is a virtual ‘who’s who’ of the music biz. Did you just consider yourself a session playing in the early days, or did you already have your eyes on a solo career or collaboration? For instance you played keys on The Byrds’ Fifth Dimension album, but were you ever given the chance to collaborate with them on the songs? Van Dyke Parks: It didn't occur to me to collaborate on songs with the Byrds. Being a studio musician was fine with me. There was alot to learn in the studio, with the rising sophistication of technology. I wanted to concentrate on that. As a matter of record: David Crosby asked me at one time to join his new group (The Byrds), and I thought better of it. Fame seemed to bring associated problems, and I wanted no part of it. I also felt (in my early twenties) that it was unseemly to want to be screamed at by adoring fans. Back in the sixties, there were many ways to contribute to a social revolution. I felt I was doing the right thing by staying in L.A., doing studio work. E.C. : Are there any sessions that stand out as especially memorable? Van Dyke Parks: All sessions are of equal importance to me. I've been lucky to be surrounded by alot of talented people, in different genres of music. If they're civil, as well as talented, it makes each session just that much more enjoyable, as well as challenging. E.C. : I imagine that Keith Moon was interesting to work with! Did that come about through your contacts with Harry Nilsson? Van Dyke Parks: Yes, Keith and Harry were good friends, and I spent a solid amount of time in their company. E.C. : Also, I’m curious about Ringo’s 1976 Rotogravure album – you are pictured on the sleeve, but not credited for playing. Did you do any arrangements on that album? Van Dyke Parks: I've come to find that album liner notes don't always give a clear picture about the participants. In the Rotogravure project, I played piano. Still, my contribution to the album was nominal. It was significant only that it introduced me to Ringo, who's turned out to be a constant companion and real friend. E.C. : Back to the album, Song Cycle. I’ve read the reviews of the album when it first came out and it seemed to be universally acclaimed, yet it sold poorly. Van Dyke Parks: It took Song Cycle ten years to recoup its recording costs. It isn't true that it has sold poorly. It simply sold slowly, and continues to do so. E.C. : Also, it was a purely ‘American’ album thematically, at a time when that sort of thing was not in vogue. Has your opinion of the album changed over the years? Van Dyke Parks: My feeling about Song Cycle? I'm sorry I was such a James Joyce fanatic. I thought there was a future in free-relating prose. Perhaps that was compounded by my love of beat poetry, I dunno. But I have no doubt that the inaccessibility of the lyrics made the record impossible to popularize. In the main, I'd say that Song Cycle is a fine piece of (4 months') work in a debut effort by a 23-year old. It was innovative. And it's still being discussed 30 years later. E.C. : Speaking of the overall ‘theme’ of Song Cycle, did you consider it a continuation of Smile’s concept of an “American Gothic Trip”? Was that intentional, or was that just your mindset at the time just having come off the Smile project? Van Dyke Parks: There was no conscious attempt to relate Song Cycle's "concept" to Smile. If anything, I'd say it was an effort to detach myself from the aborted Smile project. E.C. : Lennon had his James Joyce influences. Other than the obvious comparisons to Mark Twain, what other literary artists have made an impression on you? Van Dyke Parks: I love so many Poets, from the Ancient Greeks to the present. When I perform, I always include a poem. Most recently in concert, I cited Ferlinghetti's "Coney Island of the Mind". It is as relevant to today's social problems, the puffery of materialism, an age of anxiety, as it was when it was penned. Poets have a tough time finding a commercial opportunity. Their works should be celebrated by every self-respecting culture! They're here to shake things up. E.C. : Do these influence the way you go about writing lyrics? Van Dyke Parks: Writing of lyrics is an out of the body experience. There's nothing premeditated about it, and it's largely an unconscious or meditative process. Even the term "concept album" (which was first applied to Song Cycle) is a misnomer in my case. I never know where a project will take me. I realized long ago that good intentions, love, and anger---all collide to inform the creative process, and that it ain't worth a damn lacking a sense of discovery. E.C. : In today’s music there seems to be an overwhelming hostility. Has the ‘craft of songwriting’, or that Brill building ethic been forever lost? Van Dyke Parks: It's true that celebration takes back seat to personal pathos in song writing. Why this is I just don't know. Jim Ford....very talented songwriter said it best: Happy Songs Sell Records; Sad Songs Sell Beer. I believe it takes alot to keep an informed optimism in song writing. I try to do that in my work--for deeply personal reasons. E.C. : Your opinion - in music is genius born or made? Van Dyke Parks: I wish I knew about genius. I know that I am not a genius. The only genius I ever met was Albert Einstein. Even in Einstein, I recognize that intelligence that isn't braced with compassion is meaningless. As my dad used to say, "...brains built the bomb!" E.C. : Has your approach to songwriting changed over the years, i.e. do you approach lyric writing any different? Van Dyke Parks: It is a totally unquantifiable commodity, and that's in part because the creative process can't be codified. In my case, I just work hard, from dawn to dusk, when I'm writing. I sweat bullets! E.C. : As for melody, have you ever attempted to write songs on guitar instead of piano? Van Dyke Parks: I wrote my first song ("High Coin") on the guitar. I still keep a guitar handy. But melodies most often occur to me (in a shower, while cooking, taking out the trash, driving, or in bed) when I have the least convenience of writing them down. Capturing melody is catch-as-catch-can. I don't think any instrument or techno-innovation can make it easier. Good melodies have the gift of Epiphany. (It's a spiritual thing dude). E.C. : Do you record your songs or write them out? E.C. : The reason I ask is that Louis Armstrong recorded everything and now his tapes are a unique view into how the artist worked in the studio. The current trend is for an artist to release these 'aural sketchbooks' as an official release. Will we ever see some of your work released in this way? Van Dyke Parks: The only places that I can store my musical efforts are on paper and in computer sequence. Going to a studio (just to record a voice and piano) is a rare and expensive privilege. Of course, I'm only 59. This may change when I mature. There's no doubt that these "sequences" would be of much help to a student of composition or song-writing, and I intend to make them available, so I preserve every day's work, listed by date. E.C. : What are your opinions of unreleased tapes by artists? 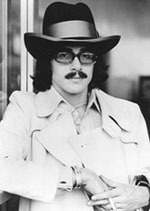 Van Dyke Parks: By my understanding, an unreleased tape is just that: Unreleased. If you mean tapes that are released without the permission of the author? That doesn't sound Kosher to me. It should be the exception, not the rule. E.C. : Leonard Bernstein called “Surf’s Up” one of the great songs of the 20th century. Do you have one song that you are most proud of? 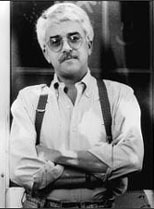 Van Dyke Parks: Each song-writing effort is of equal interest to me. But I do agree with Leonard Bernstein. Having said that, I must refer you to the Overture of "Candide", which he wrote. Bernstein was an astounding musician. E.C. : Of all your solo albums, does one stand out as a personal favorite? E.C. : Have you ever thought of doing a purely classical album, like those released by Paul McCartney? Van Dyke Parks: I don't know what a "purely classical" album is. I really don't. "Classical" is the era that followed "Baroque", in my book. "Classical" music has come to mean "Serious". I don't believe my music is serious, but I'm dead serious doing what I can to make my work entertaining. E.C. : In 1970 you became the Director of Audiovisual Services for Warner Brothers ñ this pre-dated the MTV concept by a decade. Why do you think that it didn't catch on at first? Van Dyke Parks: I don't think it helped my campaign at all when I formulated the artist-residual % interest (at 25% net). Such artist participation was unheard of then, and doesn't exist today (Madonna gets 18%, I believe. Only the top-feeders get such participation. Others start at just above 5%). E.C. : Did Warner Brothers shut it down before it got a fair shake? Van Dyke Parks: They "shut it down" after I resigned the office to continue to write music. We did 13 projects, the first was "Ry Cooder". E.C. : I’m just curious if you believe you could have been as successful as Michael Nesmith if given the proper chance. Van Dyke Parks: Nesmith's mom invented "White Out", a ubiquitous office staple. I could never match that for "success". I don't know Michael Nesmith's film work (other than "the Monkees"), so you're over my head on this one. E.C. : I know that your current emphasis has been film scoring and instrumentation/arrangements for other artists, such as Silverchair. Do you have any new projects on the horizon? Van Dyke Parks: I'm working on a new album (for Warner/Japan). I'm about to start an animated short for Pixar theatre release. I'm doing some arrangements that I'll announce On-Site when they're finished. E.C. : Are there any other current artists you would like to work with? Van Dyke Parks: I love to arrange! I enjoy working in all genres, and it's a big deal to meet new artists of another generation. I take it as an honor that I can contribute strings & horns to basic tracks, and still preserve the artist's basic intent. I don't do wallpaper. E.C. : Somewhere I read that you weren’t going to do anymore singing for commercial albums. But, I also read that you still write songs. By this did you mean no more solo albums? Or is the “Orange Crate Art” type of album a possibility in the future? Where another artist sings your songs with your arrangements? If so, what other artists would you have in mind to work with? Van Dyke Parks: If enough people buy "Orange Crate Art", I'll reconsider all of the above. It's a fine work, and I'm proud of it. E.C. : With your penchant for words, have you ever thought of an autobiography? Van Dyke Parks: I'm looking at the skewed results of others' efforts in biography. Selective memory seems to be a malaise particular to the Show Biz ego. There's simply alot of self-serving deceit in these "personal publications". I've read alot of musicians' memoir’s, feeling discouraged about this, and the public's gullibility. I want to avoid deception by all means. At the same time, I don't want to hurt people who are still alive. When/if I reconcile these contrasting concerns, I just may have a whack at it. E.C. : Finally, the Smile album…should it ever be released? Van Dyke Parks: I just don't know. E.C. : If for no other reason than to show that it was NOT like it was portrayed in the ABC-miniseries Beach Boys: An American Family. That miniseries seemed to follow the old propaganda saying of: if you tell a lie enough times, people will eventually believe it as the truth. The ‘official’ Beach Boy party line (perpetuated by the Mike Love crowd) says that it was a ‘drugged-out’ musical failure and that everything of merit has been released. Would the album have any merit with a modern release? Van Dyke Parks: I haven't heard "the album", but I believe it would do less well in the present, less tolerant, more bourgeoisie audience that was available in the 1960s.